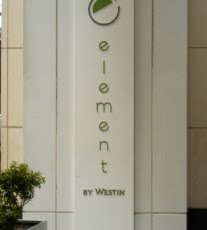 A few weeks ago my husband and I took a mini-trip up to New York City, New York and we stayed in the "posh" hotel called "Element" by the Westin hotel chain. This beautiful hotel is eco-friendly and located just west of New York Times Square. It is a fabulous hotel located near Times Square so if you are planning a trip to New York City...we highly recommend this place! The hotel has 40 floors with 10 rooms per floor. 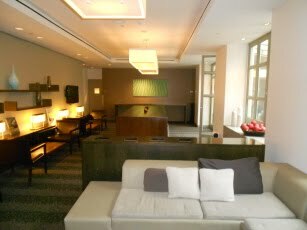 There is a beautiful front lobby where you can grab a free breakfast every morning and every evening they serve some beverages and snacks in the lobby which are also free. 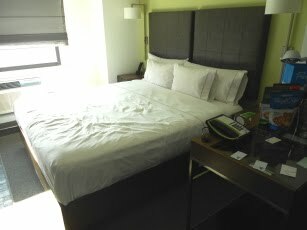 This is a rare thing for New York City hotels and definitely a big PLUS with this one! From the time we walked in the door and until the time we walked out...the entire hotel staff was very friendly and courteous! Every time we saw a staff member they greeted us and said hello. I love that about this hotel! 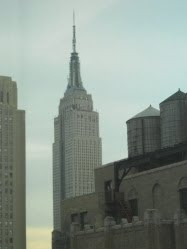 Our room was on the 30th floor and we had a great view of the Empire State Building outside our hotel room window. We loved looking at that building at night when it's all lit up and had the perfect view of it. 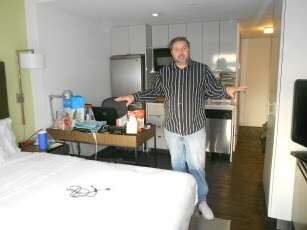 Our room was spacious (by New York City standards) and very clean! 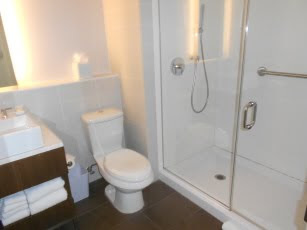 The bathroom was nice and large and we loved the large shower with glass doors. You don't need to bring any shower gels or shampoos with you because they are in pump dispensers right inside your shower stall. Hubby loved the eco-friendly bathroom fixtures and I loved the big mirrors! Our room had a full-size stainless steel refrigerator/freezer, stainless steel dishwasher, microwave oven, 2 burner range top, sink and all the dishes, cooking utensils, etc. that you would need if you wanted to prepare a meal. The sleeping area had a large king-sized comfortable bed, flat-panel tv, a desk with ergonomic desk chair, a nice closet to store your clothing and the lighting in this room was just perfect. We also appreciated that our room had free wii-fi so we were able to hook up to the internet really easily. If I had to rate this hotel on a scale of 1-10...I would give it 9 1/2 stars. I only deducted a 1/2 star because the elevator "dinging" was quite loud and we could hear the "dinging" all day/night long...but after a few hours you did get used to hearing it. Other than that...we would definitely stay here again when visiting New York City! Thanks for having us Element in New York Times Square! We would also like to thank the great folks over at Pretzel Crisps who sponsored our trip up to New York City (we were brand ambassadors for Pretzel Crisps). We had a wonderful time & we will be back again some day soon!